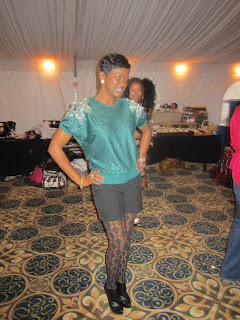 The swanky and sophisticated Swapnista Day Party was October 1, 2011 at the Hilton Hotel in Sandy Springs (Atlanta suburb). The event's organizers Keren Charles of Two Stylish Kays and DL Winfrey of Pretty Girls Rock Dresses greeted the event's attendee's with lovely arrangements, stellar hospitality, and an afternoon of fun as the Clash of the Atlanta Fashion Bloggers strutted their styles down the runway. Enjoy the two videos below that showcase the engaging styles of Fashionable Atlanta, as well as the fabulous finds of each vendor who participated in the Swapnista Day Party. Stay turned for the Swapnista Winter 2012 show. It is slated to be glamorous and "chill". Please accept my apologies if you weren't featured in the videos. These are my first videos. You guys make me wish I lived in Atlanta! How did I miss you were in the A?! I will definitely see about making it to the winter show. I was to attend this one but at last minute decided to go to another venue that I will be posting about soon. The videos were great which is why I'm compelled to be there. Thanks for sharing. What an awesome memory of Swapnista.. Thank you for posting the video!! @Babyshopa - Thank you. Girl I am not girl to tell you how long it took me to get these small videos together. Hopefully, I will improve. @LC - Atlanta is a fantastic social city. Someone is always throwing a bash, happy hour, dinner, something..it's really never a dull moment unless you want it be. @LC - Come out girl. It's certainly worth it. DL and Keren put on a great show. Super vendors too. @ KC - You're welcome and my pleasure. @Dee O - Kee Cee ^^^^ is one of the organizers. You guys should hook up. You ladies look like you had so much fun! Love the blogger community! ohh the party looks so glam and you all look amazing! @Fashion Pad- The blogger community is great! Loving your blog as well. @Pop Champagne - Thank you. @Wida - It was a great event.